Youth Welfare | Ramakrishna Math & Mission, Mangaluru. Ramakrishna Math, Mangalore is organizing Prajna’19 – Education Conclave for College Faculty on Thursday, the 14th February 2019 as per the programme given below. We invite all the interested to attend the programme and be benefited by the proceedings. Ramakrishna Mission will be observing National Youth Day on 12th January 2019 with a Youth Convention as per the programme given below. We invite all the interested to attend the programme. Ramakrishna Mission, Mangalore is organizing “Shakthi-2019” Women Empowerment Programme in Swami Vivekananda Auditorium on Friday, the 11th January 2019 as per the programme given below. We invite all the interested to attend the programme and participate in the proceedings. 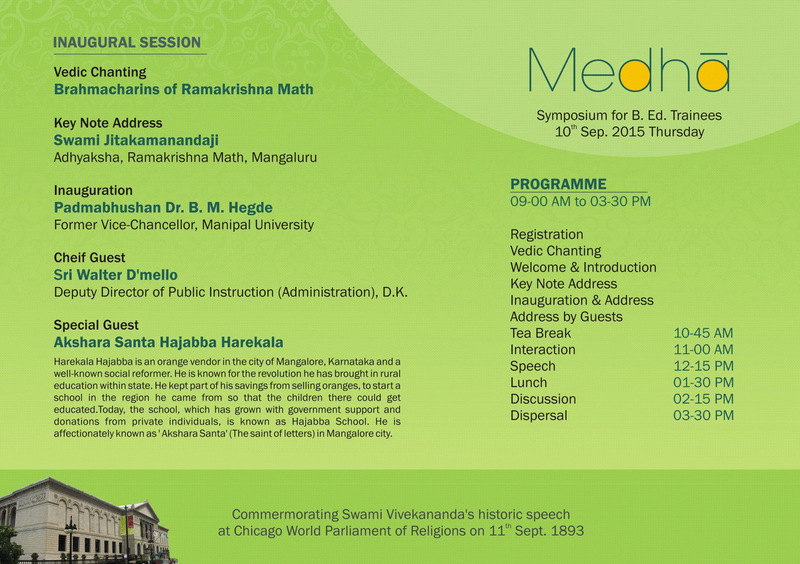 Mangalore Ramakrishna Math is organizing a special programme to commemorate 125 years of Swami Vivekananda’s historic address at the World Parliament of Religions at Chicago on 11 September as per the programme given below. We invite all our friends, well-wishers and devotees to attend the programme and be benefited. Ramakrishna Mission, Mangaluru has organized Shakti – 2018 – Women Empowerment Programme on the occasion of 150th Birth Anniversary of Sister Nivedita on 10th February 2018. The details of the programme are given below. We invite all the interested to take part in the programme. Mangalore Ramakrishna Math is organizing Youth Connection on 13th January in connection with National Youth Day Celebration. Sri Padmanabha B Acharya, Honorable Governor of Nagaland will be inaugurating the Programme at 9.30 am. This will be followed by interactive sessions by resource persons. Details of the programme are given below. Interested youth can participate. Ramakrishna Math, Mangalore is organizing Medha – Seminar for Engineering Students on the 3rd September, Saturday in the Ashrama auditorium. Sri Ravi D Channannavar, SP, Mysore District will be inaugurating the full-day seminar. We invite the interested to register their names beforehand and attend the programme on the 3rd September. 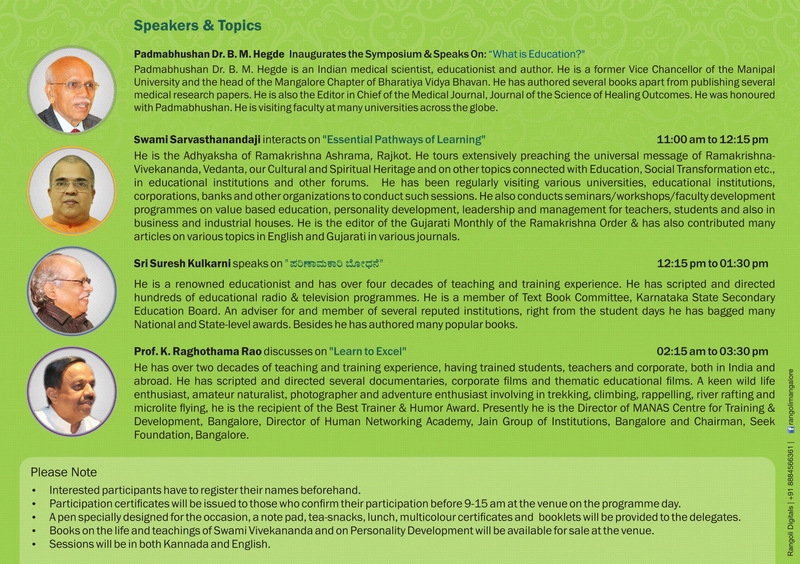 Ramakrishna Math, Mangalore organized Medha – a full day symposium for B Ed Trainees in Ashrama Auditorium on the 10th September 2015. About 520 B Ed Trainees from different Institutions of Dakshina Kannada & Udupi Dist. participated in the full day programme. The programme was inaugurated by Dr. B M Hegde, Former Vice Chancellor, Manipal University. Sri Harekala Hajabba, Philanthropist and Social Activist was the Special Invitee. Swami Sarvasthanandaji, Adhyaksha, Ramakrishna Ashrama, Rajkot, Sri Suresh Kulkarni, Educationist, Dharawad & Prof. K Raghothama Rao, Director, Human Networking Academy, Bangalore were the resource persons who interacted with the delegates. All the delegates were provided snacks, tea, lunch, complimentary books, customized pens , notebooks and participation certificates. Sri Harekala Hajabba, philanthropist and social activist was honoured for his contribution in the field of education. The Workshop started with Vedic chanting, followed by the Keynote address of Swami Jitakamanandaji, Adhyaksha, Ramakrishna Math, Mangalore on the 10th September 2014. Chairman and Managing Director of KIOCL, Bangalore, Sri Malay Chatterjee inaugurated the programme. In the inaugural address he pointed out that the present education system lacks the spiritual touch of the knowledge of the Rishis. Hence Education needs Value inculcation to protect family system, society and our country. Dr K Devraj, Director, SDM Management Studies and Research Institute, Mangalore also spoke on the occasion. Swami Sarvapriyanandaji interacted with the students on ‘Self-Control and Concentration: Two powerful ideas from Swami Vivekananda’s Philosophy of Education’. Sri Suresh Kulkarni spoke on ‘Effective Teaching Skill’ and Prof Raghothama Rao discussed the topic, ‘Presentation Skills’. Sri Santosh Alva compered during the programme. Around 500 B.Ed. students took part in the whole day workshop. All the delegates were distributed snacks, lunch, customized notepads, pens, complimentary booklets and certificates. We are organising Value Education Programmes on 9th, 10th and 11th September for College Lecturers, B.Ed. Students and Post-Graduate Students. Please find the invitation attached. Admission is only through prior registration.